EL GIGANTE ENTERS THE RING! OFFICIAL COMIC OUT NOW! I'll just skip to the juicy details contained in the official presser, but needles to say (though we have been saying it) - BUY IT NOW! We all recognize LuchaGore Productions for their gritty, gory, and incredibly entertaining films. But most of all, we love LuchaGore because of their most memorable and successful film called El Gigante. 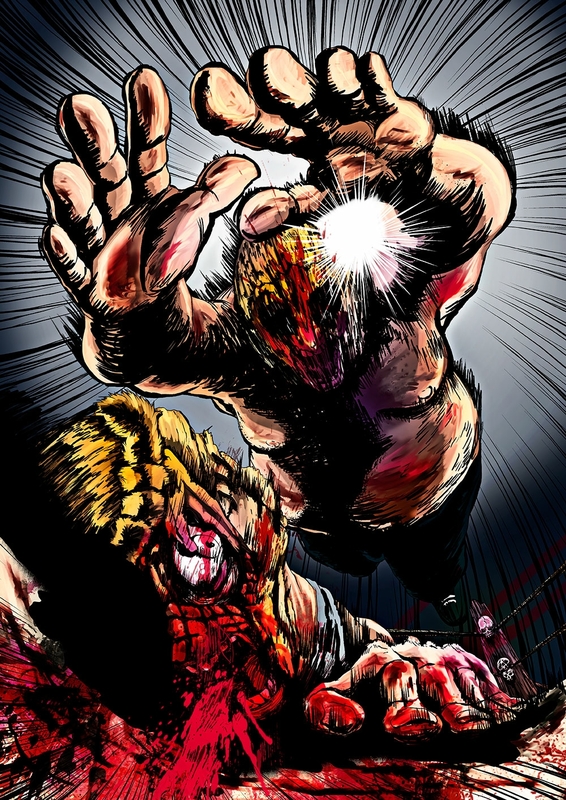 El Gigante touched the hearts of horror fans world wide and now LuchaGore is proud to present "EL GIGANTE: THE COMIC" in both English and Japanese. With its new GRAPHIC & BOLD colored take of Mexican Lucha Libre, it will leave you breathless, blood thirsty. A true revival of the film, only this time your imagination can run wilder and bloodier. Daiju Kurabayashi & Hiro Fujii came together with LuchaGore Productions to create a new brand of Horror on paper. The artistic Japanese signature of Kurabyashi and Fujii mixed in with LuchaGore's gritty Tex Mex, is a perfect combo of nightmares that will leave you wanting more! Synopsis:"After attempting to cross the US/Mexico border in search of a better life, Armando awakens in an unknown room, his body broken down and a Lucha Libre mask sewn into his neck. He attempts to escape, but is surrounded by a sadistic family, who watch him with hungry eyes. The only chance for Armando’s survival in this hellish nightmare is to last in a wrestling match against the most terrifying villain of all: GIGANTE!" EL GIGANTE features some seriously stunning art work. The reaction we had when this comic was first announced.